Throughout the Renaissance, Florence Italy was famous for its artistic output. Names like Donatello, Michelangelo and Giambologna graced the tongues of patrons across Europe. But the secret to the city’s fantastic creativity did not rest solely on individual superstars. The ruling Medici family had found a way to harness the talents of myriad lesser known artisans and use the fruits of their creative labor as a powerful political tool. Starting in the late sixteenth century, at Christmas time, boatloads of fine glass, ceramics, jewelry, stonework, and art sailed out from Tuscan ports as gifts to the royal families of Europe, who accepted the offerings gratefully. The Vatican, the Holy Roman Empire, Spain and France all had ambitions, at one time or another, to make Florence their own. These gifts, time and again, helped to smooth ruffled diplomatic feathers, reassure old allies and allowed tiny Tuscany to play the mighty kingdoms against each other, keeping Florence relatively unmolested. What the Florentines lacked in military might, they made up for in sheer artistic creativity. At home, this strategy depended on the constant attraction of new talent and deep support of all the arts. At the Uffizi palace, Grand Duke Ferdinando set up a kind of innovation center, called the Galleria dei Lavori (Gallery of the Works), where new techniques were pioneered. His father, Grand Duke Cosimo had already built a glass furnace there, staffed by Venetian masters imported from Murano. In adjacent areas, stone cutters worked minerals collected from around the world into fabulous inlaid table tops and floors in an art called pietre dure. Goldsmiths worked with gem cutters to create exquisite jewelry. Designers and illustrators brought the natural world into new creations that integrated these arts together for the first time. This was the world in which a young Antonio Neri grew up; the son of a famous physician, he matured into an alchemist with a profound respect for the healing arts, but also into a glassmaker—a conciatore—to the Medici prince Don Antonio. A key to Florence's creative output was the Medici innovation of housing artists of different disciplines under one roof. A cross pollination of ideas took place that spurred new ideas in individual arts, but also gave birth to the creation of objects which combined the talents of several different arts. Fine wooden furniture graced with inlaid stone, glass used to imitate exotic minerals and rock crystal, fanciful goblets and pitchers that integrated metalwork, glass, shell and other exotic materials. Because in order to make vessels and drinking glasses where the glass is thin, you must really load it with a lot of color, but for making large cane for beads not so great a charge of color is necessary. For making thin cane for small beads, you must charge it well with color. In working the glass, you must apportion it with more or less color according to the purpose it must serve. To work lead glass into various drinking glasses or other vessels, or even to draw cane for beadmaking, it is necessary to raise the punty [out of the melt], and to make a gather of glass by turning. Take it out, let it cool somewhat and then work it on a well-cleaned marble [marver]. The marble should be somewhat cool, and well bathed with water before use. This practice will ensure that the paste of the lead glass does not pull up any of the marble. The glass will always gall marble not bathed in water. Some chips will incorporate into the work, giving it an ugly look. Therefore, frequently flush the marble with fresh water for as long as you are working the glass. Otherwise, all its grace and beauty will be lost. Unlike his famous brethren Donatello, Michelangelo and his neighbor Giambologna, Antonio Neri was not a superstar and as an alchemist he did not work alone; he was part of a team. He ably represents the small army of workers who supported the Medici creative machine that spread fine craftwork throughout Europe. *This post first appeared here on 19 March 2014. 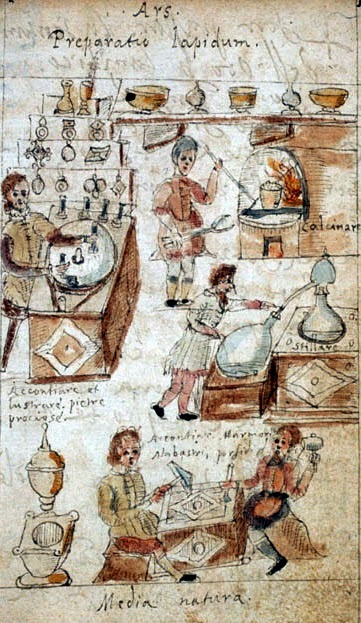 In sixteenth and seventeenth century Florence, a "conciatore" was a specialist in alchemy who formulated glass from raw materials. It is probably a corruption of the Venetian term for the same profession: "conzaor. " I am an independent researcher with a long standing interest in the people surrounding glass and glassmaking from its earliest incarnations to the present. This blog started in 2013 as a companion to a book of the same title that is a biography of Antonio Neri. It proved popular enough to keep blogging, plus, I enjoy the interaction it provides with my readers. As my interest in glass history has broadened I ocassionally post new material based on my more current research.